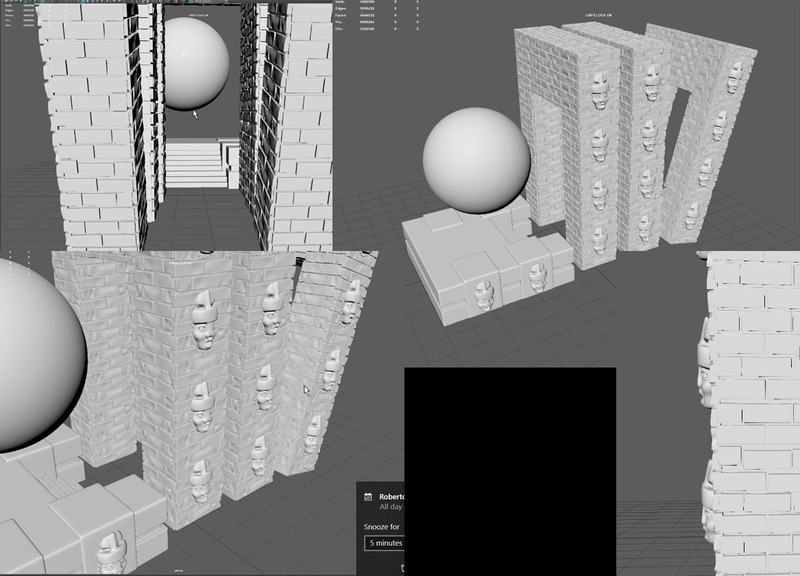 I’m modeling some kind of ruins in Maya. I want to make a camera travelling from the center of the sphere to the outside, passing through the arcs and I’m having some trouble trying to figure out the best workflow possible. My idea was to make different UV sets and combining all elements so I can import them all together to Substance Painter so I can take advantage of Substance’s smart materials and masks but it’s already a lot of geometry. With the bricks I could use a bump or normal map but I want to conserve the details on the edges so it could look more appealing and interesting. I don’t know if a displacement could work for the edges and for the prehispanic masks I put on the arcs. I know it can work with the mask but seeing them from certain perspective (shown below) I don’t know if it can make it. Any thoughts and advice are all welcome and I thank you very much in advance for your help and attention. Almost all of that geometry should be (could be, anyway) done with shaders and displacement instead. Especially the bricks. But you really only have three unique geometries there, that I can detect. The arch, the mask, and the platform. So you would only actually need three separate textures (Substances) to do this. Thank you very much for the help. Do you think it’s possible to do the same with the masks? Or the displacement with the masks will be as good as the bricks. You can definitely improve those masks with displacement shaders. Just make sure they have clean UV-maps.